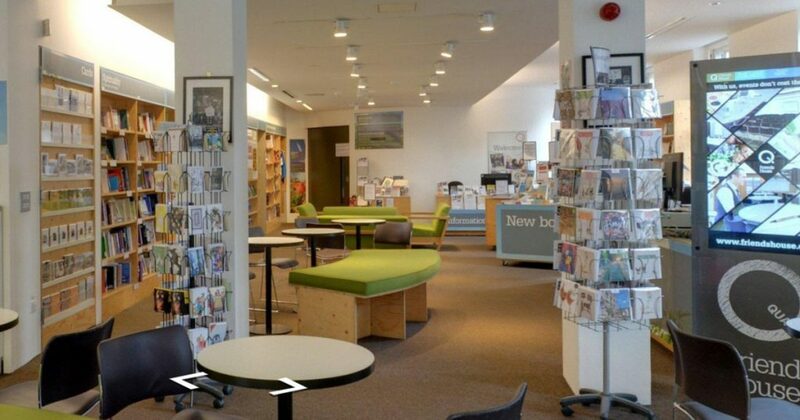 The Quaker Centre Bookshop is based in Friends House, Euston Road. Our stock is informed by Quaker faith and work, with books on peace, social justice, anti-racism, politics, LGBT rights, activism, ecology, feminism and religion and spirituality, as well as a large selection of progressive and spiritual children’s books. We also sell books published by Quakers in Britain. Our adjoining café has excellent cake. Help October Books to Buy a Bank! 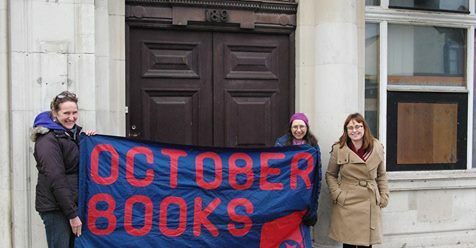 October Books, Southampton’s only independent bookshop, is buying a bank! We’re borrowing funds directly from the community to buy the Natwest building on Portswood Road in Southampton. The aim is to create not only a new home for the bookshop, but also a venue for community events, workshops and meetings. We’re looking to raise £360K from loanstock and donations and we’re now over half way there. We have a crowdfunder for donations, however, most of the funds are being raised through the issuing of loanstock. Loanstock is a kind of community share in which interested people can purchase stock which is then later paid back with interest when the stock matures. The rest of the funds for purchase and renovation are being raised through a co-operative community loan, and (when the building is bought) sale of the upper floor to the Society of St James. The Society of St James is a Hampshire-based charity who provide supported housing for homeless people. 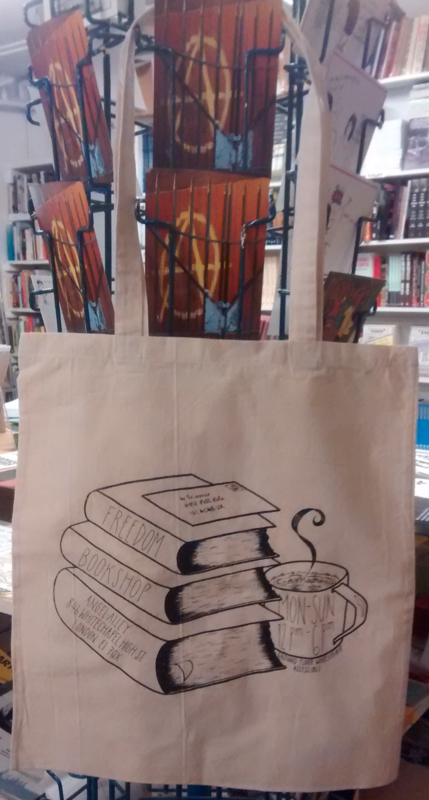 October Books is a co-operative radical not-for-profit bookshop. It’s run directly by the workers, with the help of customers members of the co-operative, with profits going back into the shop. It turned 40 last year, having been in the Portswood area of Southampton for the last 15 years. The shop sells a wide range of new books and magazines with a special focus on political, social and environmental issues. It also sells organic and Fairtrade products. May 13, 2018 | Categories: Uncategorized | Comments Off on Help October Books to Buy a Bank! On Saturday 27th January 2018 Derry will host its, now annual, second Radical Bookfair at Pilots Row Community Centre in the city’s Bogside area. We are pleased to announce that following on from last years successful first ever Radical Bookfair in Derry that we will begin plans to hold our second annual Radical Bookfair in 2018. 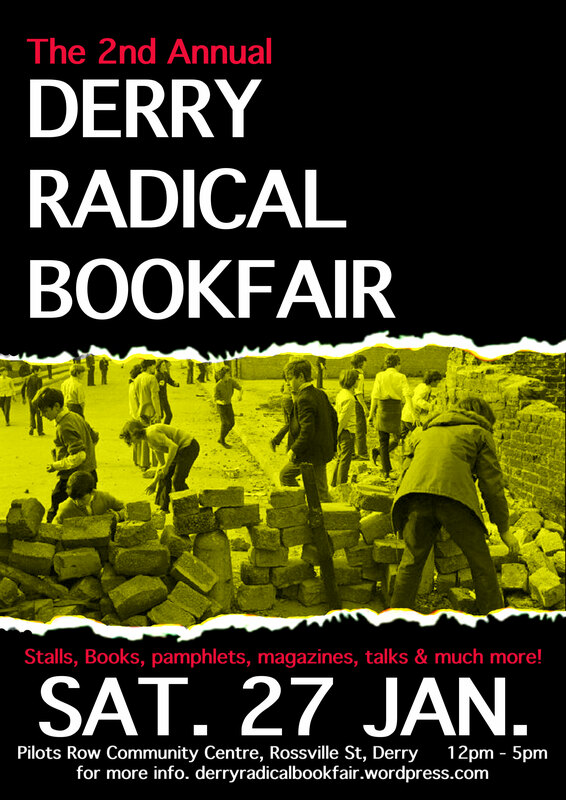 Following on from this years event held during the Bloody Sunday week of events we have had continuous support and encouragement to make the Radical Bookfair an annual event as part of the political calendar of Derry. Our first Radical Bookfair played host to many participants from all over Ireland, England, Scotland and Wales played part of the Bloody Sunday week of events leading up to the annual Bloody Sunday March, which itself hosted a series discussions and debates, film and theatre that centred around a wide range of local, national and international contemporary social justice issues. As ever we would like to extend our hand to participants again to the Radical Bookfair with different visions, ideas, practices and radical traditions. Again we hope that our second annual book fair will be used as an opening in support of small press publishers and independent book sellers and producers, circulating radical reading materials and information from independent distributers, non-party political campaigns and groups to share their publications and merchandise, which normally would be hard or impossible to find at mainstream book shops. Books of local, national and international interests including social and labour history as well as themes covering radical feminism, queer liberation, anarchism, marxism, republicanism and environmentalism. It is worth noting that Derry has a long and proud tradition of working class radicalism which has influenced many historical events, standing out beyond most other cities that has both challenged and changed society around us for the better. At present we are allocating stall space and as seen last year at our first ever radical bookfair, space is limited. If your book store, distribution or publishing collective would like to book a place at the radical bookfair then now is the time to confirm. At the moment things are staring to take shape and its looking to be an amazing day of stalls, books, records, zines from independent booksellers, political and historical groups, local radical projects, small press and more. Freedom needs your help! 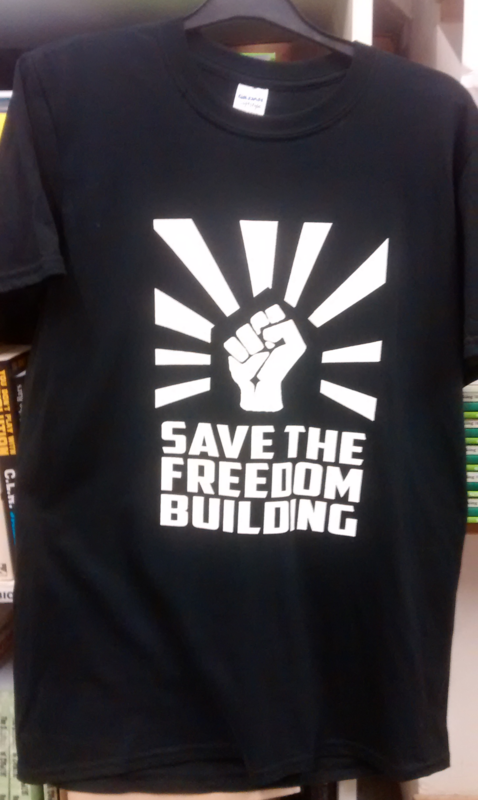 Or at least the Freedom Building in Whitechapel does. One of East London’s last radical bastions, since we moved into 84b in 1968 the Freedom building has weathered firebombs, arrests, police infiltration, stalkers, threats of all kinds and more movement shenanigans than you can shake a very large stick at. And now we’re facing a major rebuilding project, costing up to £50,000, including vital works to fix the roof, walls and even stairs. 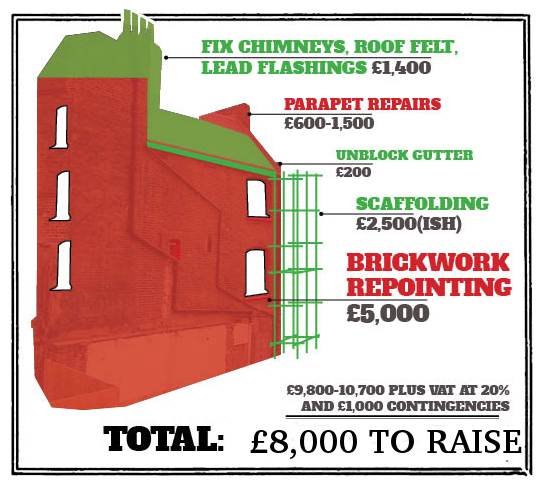 A survey carried out last year highlighted that emergency repairs are needed to the roof and walls that will total around £13,000. Our aim is to raise this amount by August 2017 so that the building works can take place in the Summer. As of February 2017 we have raised £5,000 to get us started. But the fun doesn’t stop there – over the coming three years we will need a lot more money to treat dampness in the walls, insulate the building, install a boiler and look into making the whole place more accessible. In the long term costs could be between £40-50,000 to bring the building back to its best, including things like fixing up the lovely (but old-style) sash windows. The building is an important resource providing space for; an anarchist bookshop that is open 7 days of the week; Freedom news and publishing group that has been producing anarchist propaganda since 1886; office space for Haven Distribution, Soldiarity Federation, Anarchist Federation, Corporate Watch, IWW UK, the National Bargee Travellers Association – London branch and the Advisory Service for Squatters ; Decentre , a social room for meetings, events and organising; and for supporting groups such as London ABC , Legal Defence and Monitoring and the Green and Black Cross who regularly use the building. Help us bring 84 back to its best so we can continue to work as a vital hub for the anarchist movement!